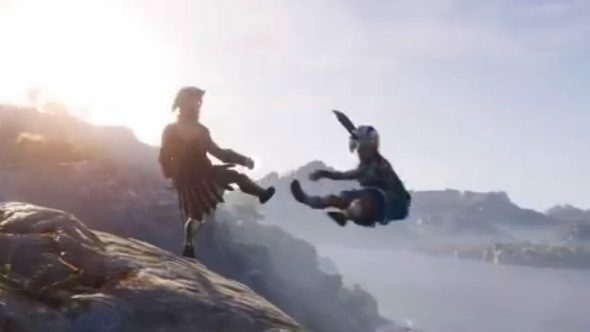 Assassin’s Creed Odyssey is the next game in Ubisoft’s stealthy series, with the ancient Greek setting confirmed yesterday after a series of rumours and leaks over the past few weeks. We’ll likely learn more at Ubisoft’s E3 conference on June 9, but until then a few sources have offered some hints as to what new features the game will introduce. The series saw a departure from its relatively rigid format and annual release schedule in the wake of London-set Assassin’s Creed Syndicate. Two years later, we got Assassin’s Creed Origins, which shook up the series by taking it back to its very beginnings. Now, Odyssey looks set to build on the changes that Origins introduced. Excited for Assassin’s Creed Odyssey? CHeck out some more upcoming PC games. Sources have told Kotaku that Odyssey will add dialogue choices to the series for the first time, adding to the Witcher-style changes kicked off with Origins. You’ll also reportedly be able to choose your protagonist for the first time, with a choice between a male or female main protagonist. However, it seems that Bayek, the protagonist from Origins, won’t return. Two of Kotaku’s sources confirmed that the Assassin’s Creed Odyssey release date will be during Ubisoft’s 2019 fiscal year. That would mean it’d need to release before the end of March 2019, suggesting Ubisoft are returning the series to an yearly release schedule. With that in mind, I’d expect to see Origins sometime this autumn.